I’m back! I got home last night after two nights of no proper sleep at all and my head still feels dizzy. But it’s all worth it! Japan is such a beautiful, inspiring place. Its culture even more interesting that I imagined. But back to the comic! This Sunday is Bookwyrms’ 2nd Anniversary. Time flies! I’m very grateful for the community of readers it has gathered in these two years, thank you all! Just like I did last year, I’m going to take this opportunity to spread the word about Bookwyrms, so this Sunday 26th I’ll be releasing the new Bookwyrms wallpaper and I will share posts about it on twitter, facebook and tumblr. Anyone sharing these posts will be helping hugely to raise the comic’s visibility, so as a thank you, I will choose one of them randomly to get a full design of themselves as a character in the comic! Unfortunately there are no upcoming scenes this time where even background characters can appear so, if the winner agrees, they can show up in the comic the next time a background character is required : D If you want to participate in this draw, just make sure you reply to any of the social media posts about the wallpaper as well as share it. Last year I asked for your favourite character, and this time I’m going to ask you: what character are you most suspicious of? – Participate from Facebook by sharing publicly the post about the 2Year Wallpaper and replying to it with your most suspicious character. – Participate from Twitter by retweeting the tweet about the 2Year Wallpaper and replying to it with your most suspicious character. – Participate from tumblr by reblogging the post about the 2Year Wallpaper and replying to it with your most suspicious character. – You don’t have to buy the 2Year Wallpaper to participate, what I value here is the will to spread the word about the comic! – The deadline to take part in the draw will be Wednesday 29th at 5pm GMT. After that, I’ll add all names to random.org (or similar website) and will announce the winner the next day, Thursday 30th, when the new page goes up. OH and that same day I will also make that announcement I said about something I started working on which was not the printed edition. Can’t wait! PS2. My brain is not at its best right now, so I might be forgetting something/be giving confusing information. In that case I’ll update this later, please bear with me! Whooo welcome back! Glad Japan was awesome. This all sounds super exciting, I’ll be sure to participate in the draw and I’m looking forward to the announcement. And happy birthday to Bookwyrms in advance! About the page: hmmmm, larger than wanting to put an entire community in a wrong light? What could it be!? Also, don’t come between Kveld and her books, appearantly! WHOOOOOO!!!! Bookwyrms is back, and I am so excited, but I’m also so glad you had fun in Japan. I’ll be sure to come back on Wednesday to comment, but in case it slips my mind… HAPPY BIRTHDAY BOOKWYRMS, and congrats Lorena! You’ve come so far! 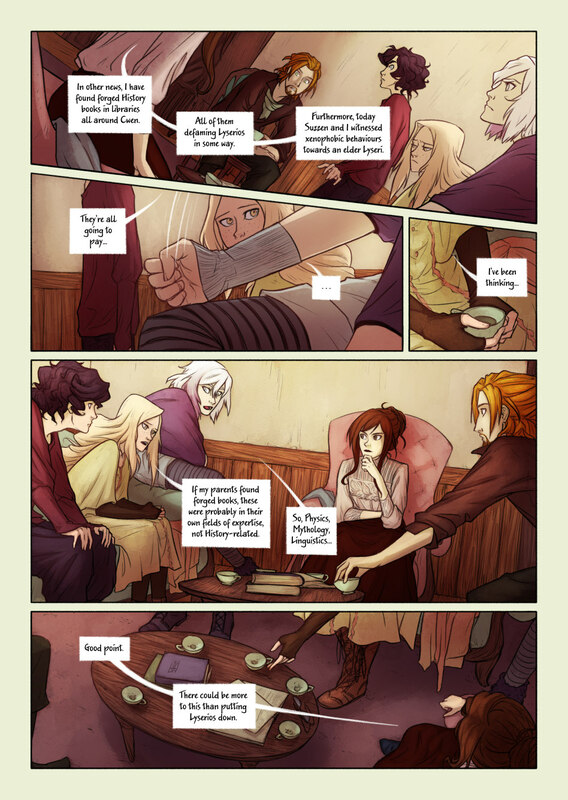 I really wish I could spread the word about Bookwyrms on a larger scale, but my parents won’t allow me to get any form of social media. I’ll see if my mom will let me use hers, but I’m unsure that will work. Either way, prize or not, I’ll be sure to do my best to spread the word about your phenomenal comic, whether it be by social media or by word of mouth. Onto the page: 1) I’ve spent like… 10 minutes thinking about a larger picture, but I really can’t think of any… mysterious… I’ll keep thinking. 2) Dylion’s face of shock and confusion in all of these panels gives me life! Thank you very much, Sara, I really appreciate that you want to spread the word about the comic! I’m sorry to hear you can’t use any social media because I wish you could take part in the draw but I’m not sure how I can make that happen without it being unfair to the rest of people sharing it online :S I’ll keep thinking about it, though! Oh no, please don’t worry about it, as it would absolutely be unfair to those sharing on a larger scale, not to mention that they would also have proof. I just wanted to let you know that I will do my best on my own terms, because your work is amazing and more people should see it. However, thank you for thinking of me, but please, don’t worry about it. I really don’t know how I could change the rules for it to be more fair with your situation, I’m sorry about that! Thank you very much for understanding, Sara!